We’ve had this grammar war before when son procured more than one mouse for his computer. It came up again last night when I proudly declared to the fam how many mouses I had caught. I know…I should have said ‘mice’, but I was trying to soften the blow for the tender hearts among us. Those kids sitting up late at night had made the fatal mistake of becoming well acquainted with the burgeoning population we have been hosting. They even named them. As for the dog? She has become so used to them running around the corners of the wall that she hardly even raises an eyelid in their direction. Diligently I have been putting out bait traps but with little improvement. When the little brown bundles of fur popped out of the toaster I decided to bring in the big guns. This was war! 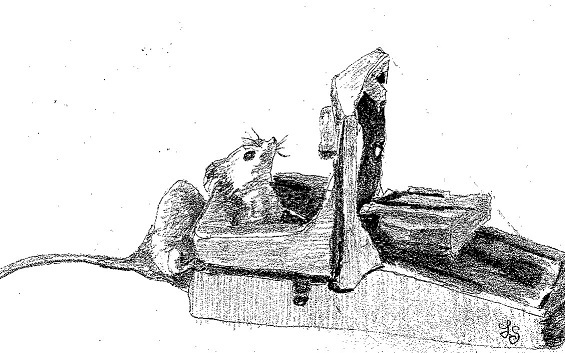 Peanut butter in a mouse trap. To date I am up to 9 deaths in just a few days. However, my elation is not shared by emotionally attached kids. At each death they have checked to see which friend they will see no more. Insert mother’s rolling eyes here! But, does he realise how grateful I am? !